From 1933 during the Nazi era when Hitler refashioned the German judicial system in line with his oppressive regime, many crimes became capital offences which led to a drastic increase in the number of executions. In 1936, the Reich Minister of Justice, Franz Gurtner, acting upon Hitler’s direction, ordered that the fallbeil, a variation on the guillotine, replace the hand axe as the official method for all civil executions throughout Germany. To meet this new demand for ‘justice’, many prisons were designated as execution sites and equipped with a ‘Tegel Fallbeil’, named after the inmates of the Tegal prison in Berlin who first built these atrocious contraptions. Beheaded by Hitler: Cruelty of the Nazis, Judicial Terror and Civilian Executions 1933-1945 provides the reader with a chilling insight into the judicial terror that took place and the harrowing stories of execution by fallbeil of civilians who were convicted of domestic resistance to the Nazi regime, treason and other offences after so called ‘trials’ by the Volksgerichtshof or People’s Court. 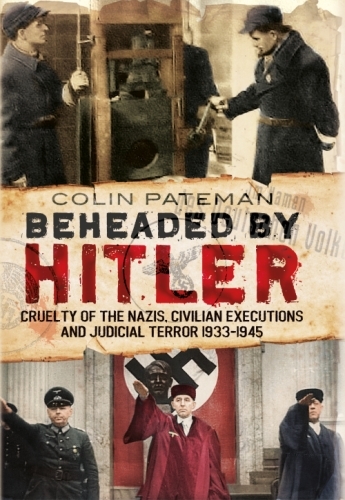 This exceptionally well researched book also explains the Nazi judicial system, the prisons selected for central execution sites and the Nazi officials and executioners that carried out Hitler’s cleansing.